The once-unstoppable fraternity of key aides hailing from President Lee Myung-bak’s hometown of Pohang appears to be on the brink of collapse. 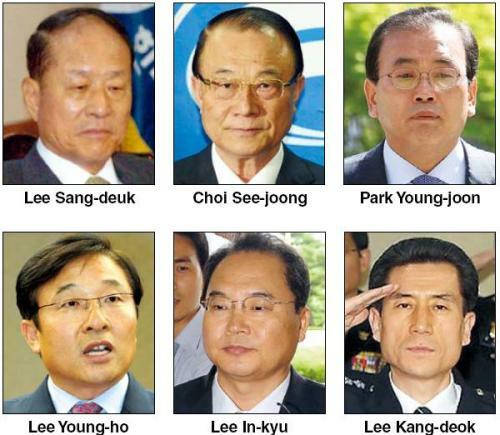 The lineup of Lee’s key associates, popularly referred to as the “Yeongpo line” is again embroiled in a major bribery scandal involving an alleged cash-for-favors deal for a construction project named Picity. “Yeongpo” stands for Yeongil of Pohang, in North Gyeongsang Province. Although Lee was born in Osaka, Japan, he grew up in Pohang. Purportedly led by Lee’s elder brother Lee Sang-deuk, the group has been at the center of attention throughout his administration as Lee’s entrusted circle of aides, but lately more as an origin of scandals. A significant case was the government’s illegal surveillance of civilians, for which Pohang-affiliated members of the Prime Minister’s Office were held responsible. “The involvement of the president’s key figures in scandals is a classic case of corruption of authority. While it may be hard to hold President Lee responsible directly, he must share a sense of guilt for poor management of his close associates,” said Park Hyo-chong, ethics education professor at Seoul National University. “A great number of such scandals would also have been avoided if the personnel decisions were more centered toward the public interest,” he added. Initially, the name Yeongpo referred to “Yeongpo Mokwoohoe,” a private association established in the 1980s to promote friendly exchanges among Pohang-native public officials serving in central government posts. The organization is said to have more than 100 members. Among them are Lee Sang-deuk and Choi See-joong, a former chairman of the Korea Communications Commission, who is currently in custody over the Picity case. While the association faced criticism in 2008 for allegedly wielding inappropriate influence after Lee’s presidential election, the group has since denied the allegations of corruption made against its members. Yeongpo line is now more commonly used to describe key presidential aides, government officials and politicians with local ties to President Lee. The opposition forces have since used the Yeongpo line description to keep their check on the administration’s personnel designations based on regionalism and kinship. “A successor to the National Police Agency commissioner should not come from Yeongpo line,” the opposition Democratic United Party had said last month over reports that Pohang-native Lee Kang-deok, the Seoul Metropolitan Police Agency commissioner, was being dubbed to replace Cho Hyun-oh. Cho has stepped down over the poor police response to a Suwon murder case. Lee Kang-deok was later named as a head of the Korea Coast Guard instead. Prosecutors’ focus on the investigation into the Picity bribery case is bringing the spotlight back on the Yeongpo line, as most of those implicated come from Pohang. Choi See-joong, former communications policy chief, was arrested on April 30 on charges of receiving about 800 million won from Lee Jeong-bae, a former representative of Picity, through a broker named Lee Dong-ryul, in return for his influence in getting the project approved by the Seoul Metropolitan City government. Lee Dong-ryul is also a Pohang native and is Choi’s junior by 14 years. Park Young-joon, a vice knowledge economy minister who is next in line for the prosecutors’ bribery charge, is also said to have close connections with the Yeongpo line. Although Park grew up in Chilgok, North Gyeongsang Province, he assisted Lee Sang-deuk for over a decade, and is considered pseudo-Yeongpo. The prosecutors sought for Park’s arrest along with a Seoul City official on Thursday. Park is also under the prosecution’s radar for his alleged involvement in the civilian surveillance case. Of those implicated in the surveillance case, at least two are from Pohang, such as Lee Young-ho, a former presidential secretary for employment and labor affairs who is indicted for ordering the ethics division of the Prime Minister’s Office to delete surveillance data, as well as Lee In-kyu, who headed the ethics division at the time. Lee Sang-deuk himself has been implicated in another bribery scandal linked to SLS chairman Lee Kuk-chul. Upon facing a prosecutorial investigation, Lee Sang-deuk announced his retirement from politics earlier this year. In finance, National Agricultural Cooperative Federation chairman Choi Won-byung is said to among those belonging to the Yeongpo line. Choi graduated from the same school as the president. Choi had faced vehement calls for his resignation last April when the federation’s online network crashed, which later was revealed to be caused by a North Korean cyber-attack. Choi was reelected to the post in November.